No menu plan this week. I don't know what's for supper tomorrow. I'm feeling a little panicky about it. Because I just know that those people who live here, you know, the ones who leave the lights on and forget to flush the toilet and fling their possessions about, they get hungry. And they appear to be unwilling or unable to feed themselves anything other than cereal or granola bars. I don't want them to eat cereal or granola bars, at least, not all the time. The problem is, I don't want to eat the things those people want to eat. And they don't want to eat the things that I want to eat. And I'm tired of having to make food that one or more of the people who live here are going to be disappointed about every day. Am I being too whiny? OK. I'll stop now. The whining, and the meal planning. On the bright side, I finally made the (deconstructed) turkey pot pie last week. Well, sort of. Not really. But it was close enough that I don't feel like I have to put it on the menu again. Not that I have a menu this week. So I have nothing to put it on, even if I felt like I had to. And on the other bright side, those people who live here won't starve, or become nutritionally deficient, if I take an itty bitty planning break. So, friends, what's on your menu this week? Too cheesy? Yeah. Agreed. I won't do that again. So...our Christmas tree is still up, but it's no longer in the house. So that's a change. Our Christmas tree is still up. I asked the kids again on Saturday night if they would like to start taking ornaments off the tree, and they again politely declined. My nativity is still up, too. Both great reminders. I know that I've mentioned that September feels more like a new year to me than January. But January also feels like a good time for a fresh start. I used to make new year's resolutions, I think because my elementary school teachers thought new year's resolutions would make a good writing assignment. But then I discovered that resolutions don't stick. So I stopped making resolutions, and started making goals. 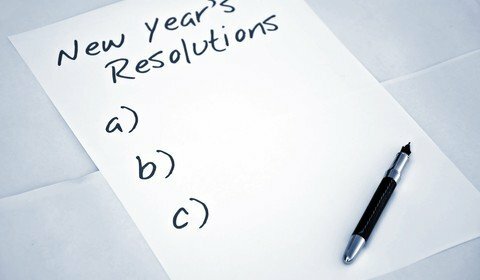 You see, a resolution is usually a broad, overarching statement. It's too big. A goal, however, is a specific, achievable intention. I don't know, I guess goals seem less intimidating than resolutions. Mine were always silly, fun goals, usually involving food. One year my goal was to make a pie crust and get it into the pan without it cracking. Another year my goal was to make paper. You get the idea. And then I got lost in the trenches of motherhood and couldn't find my way out long enough to think of a goal, let alone achieve it. Finally able to pop my head up and look around, two years ago, I embarked on the Positive Project. to stalk a Facebook friend of mine enough to show up in one of those quizzes on her wall, like, "who's in your reindeer family?" or "what does your week with friends look like?" or "which friends will be in the same nursing home as you?" I achieved this goal in November. I showed up in "which 20 names play an important roll in your life?" Yes, twenty. And I told her to do it but give me about 10 minutes to go like and comment on everything on her wall first, but it counts! So glad she was so cooperative (although she was probably happy to do it so I would stop stalking her). So good, in fact, that buoyed by my success, I'm back at it this year, with more goals than ever before. I hope I'm not being too ambitious. Make reusable cleaning wipes (I know, it's kind of silly, considering the fact that whenever I spray cleaning solution, then wipe with a washcloth, I'm using something reusable to clean, but I want to have a tub of wipes. And I want them to be reusable). Try something new from Trader Joes each month. I love Trader Joes. It's such a fun store, and it seems like there's always something new, but I hardly ever get over there because other errands take precedence. And I hardly ever buy anything, because there's just so much to choose from--it's a bit overwhelming, because I want to try all the things. This year, I'm scheduling a once a month visit (I might might take the summer off...), and I have to buy something each time (if you have any suggestions, leave them in the comments). Have a prayer focus each month, praying for a specific person (outside of my family) or situation every day for that month. How about you? Did you make any resolutions or set any goals this year? On the twelfth day of Christmas (which is January 6, for those of you who don't know), I asked my family if they would like to start taking ornaments off the Christmas tree. They politely declined, and insisted that the tree needs to stay up for a while longer. I think "a while longer" probably means at least until Valentine's day (we definitely need some valentine's ornaments...). Whatever. I've never really understood the compulsion some people have to obliterate all traces of Christmas as soon after the event as possible. I mean, if anything, the decorations should be up longer after Christmas than before to remind us that God-with-us is indeed with us. I guess there is something to be said, however, about January 1 being a new start--the calendar flip of all calendar flips--and people want the new start to be free of Christmas decor. In any case, our Christmas tree remains decorated and standing proud, while our family goes about our regular business. And while we go about our regular business, we will eat. Most of my containers are either cardboard boxes, or food containers of odd sizes that I can't have in my kitchen anymore because all of my containers need to be stackable (it's a rule--which is also a helpful organizing tool). A rule is, well, a rule. It's something that you always do when faced with a certain situation, so that you don't have to think about what to do. In this case, the rules have to do with whether or not to keep an item. For the Container Concept, the rule is: all of one kind of item must be able to fit in the container (and remember, the container can be an actual container, or a shelf, room, closet, or even a whole house). My food storage container rule is: all of my plastic containers for food storage need to be able to nest. Anything that doesn't nest needs to go (or not come in in the first place). For leftovers, I use three sizes of Glad food storage containers (with capacities of 3 cups, 1.5 cups, and 1/2 cup). I choose Glad because I wanted containers that would nest (obviously) and were inexpensive enough to get a lot of. Glad happened to be the brand that was on sale when I went to the store to buy my containers. The containers all stack together, the lids snap together, and I the only reason I ever would have trouble finding a container for leftovers is if all of the containers are being used. And if that happens, I know it's time to have a leftover eating party. I also have some larger containers that I use for cookies or muffins. These larger containers all nest as well, and the smaller containers sit inside the smallest of the large containers. It was not easy for me to get rid of the containers that didn't match. There was absolutely nothing wrong with them except for the fact that they were odd sizes, and it goes against my frugalness-gene to get rid of things that are still potentially useful. But the fact that my "tupperware" cupboard is streamlined--the rule--makes my life so much easier. It also makes it easier for people who are not familiar with my kitchen to help put leftovers away. It was worth the discomfort of letting go to achieve the peace of better organization. Socks with holes in them are garbage. Garbage is thrown immediately in the trash. I am not going to mend that sock. I am not going to make something crafty with that sock, and if I do suddenly experience a strong desire to do something crafty with a holey sock, there will be another one soon--two of my boys, in particular, are very good at making holes in their socks. So I can get rid of it without angst or regret. Your turn: what rules work for you? Or what rules could you implement to make your life easier? Let me know in the comments! Happy 2017, y'all! Good thing I didn't resolve to be punctual this year, 'cause I'm a day and a half late. Our kiddos had a week and a day off school for winter break, and we spent the entire 10 days (the six days off, plus two weekends) with people, most of it away from home. It would have been nice to have a day or two to recuperate before the boys had to go back to school, but we were happy to see all the family during that time. Actually, let's get real. It would have been nice to have a day or two to put the kids to work cleaning and putting everything back where it belongs before they went back to school... But alas, not having minions to do my bidding during clean-up is the price to be paid for all that extended-family togetherness.